This upscale hotel is set in the heart of one of Canada's most appealing cities. 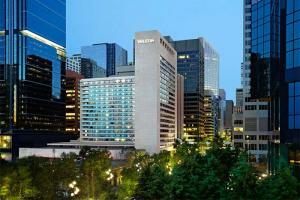 The Westin Calgary is minutes away from incredible outdoor activities and first-class dining and arts. Guests can appreciate the peace and quiet of the 525 newly renovated luxurious guest rooms. Packed with exciting attractions, activities, museums, beautiful parks, entertainment and sport venues, there is never a shortage of things to do in Calgary. Located in downtown Calgary, next to the CORE Shopping Centre. Essence - American cuisine; Liquid Lounge; The Keg Steakhouse & Bar - Steak and Seafood. tephen Avenue, Glenbow Museum, Calgary Tower, Calgary Stampede, Fort Calgary, Calgary Zoo, Heritage Park, Spruce Meadows, Ski Alberta.